Our fully equipped boats and experienced captains will ensure you to enjoy fishing. We also offer you "You Catch, We Cook" option which we cook the catch of the day for you to enjoy the great taste of freshest fish with your beloved ones. For Fishing min 4 is required. The price is for 4 person. Extra person is additional. Sport fishing is a form of recreational fishing where the primary reward is the challenge of finding and catching the fish rather than the culinary or financial value of the fish’s flesh. The distincion is not completely rigid – in many cases, sport fishers will also eat their catch. The philosophies and tactics used for sport fishing, however, are usually sufficiently different from “food fishing” to make the distinction clear enough. Adventure Sports Charters offers you two trips to choose from. If you only want to take a quick ride to check what is biting, a four-hour package might be the right choice. Fishing rods, reels, tackle, and lures for trolling will be included in your trip, as well as spinning rods and bait for casting and bottom fishing. The crew will offer water and soft drinks and will cleaned and packed your fish to take home with you. What is more, if you want you can have your catch cooked in a local hotel’s restaurant for an additional charge. 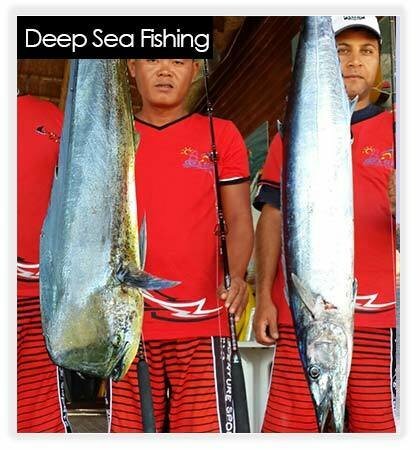 Deep Sea Fishing involves going out into the sea and fishing in deep waters or at the bottom of the sea. This is only for the experienced anglers who want to take recreational Fishing to the next level. It offers fishermen a great opportunity to catch different fish species which are definitely more massive than those normally caught when fishing in shallow water. It can also be very challenging so adequate planning, enough knowledge on the ins and outs of this offshore activity, and suitable pieces of equipment are of utmost importance.